Here’s a little something for the nursery walls that looks just as good once the lights are off! 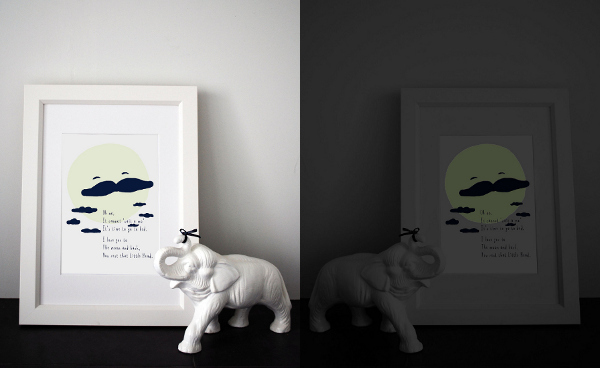 We’re always on the lookout for nursery art that’s a little bit different, and this print from A Little Ink (titled The Little Moon Print) glows in the dark! Learning the difference between day and night is the first great milestone in every baby’s life (certainly as far as their parents are concerned!) – and perhaps it will come a little bit faster with a constant reminder hanging on the nursery walls. 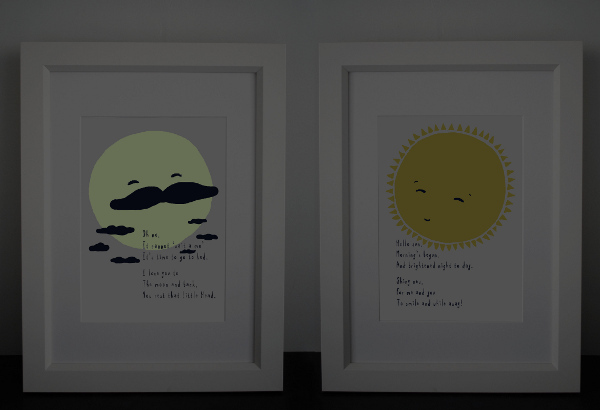 The prints from A Little Ink are a beautiful marriage of original artwork and poetry that would provide an endearing touch in any nursery or playroom. Artist Jenny Palmer relies on locally made, fair trade, eco-friendly materials to produce her lovely artworks and cards. The screen prints pictured here will fit a standard A4 frame, but she also sells prints in A3 size. The Little Moon Print is US$29, but if you buy it together with The Little Sun Print (below), you can get them both for US$50. Browse and buy directly from A Little Ink.